I learned quite a bit about his history – he was raised in an apartment in Scarborough with a number of children and very little socialization with the outside world. His next home would be with a couple who used heavy punishment in the short time they had him. He ended up back in rescue and was introduced to positive reinforcement training before coming home to me. I was stoked. 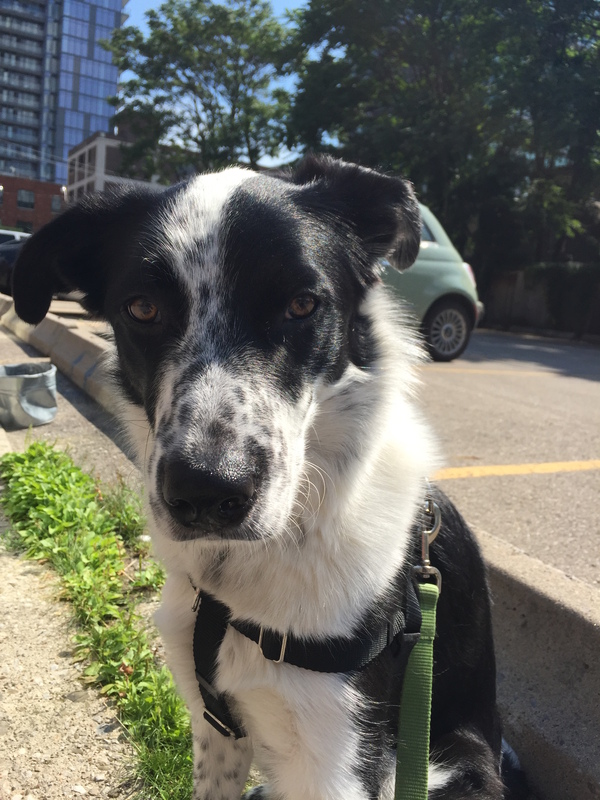 A one year old, male dog with a few challenges to work through. A dog who is food and toy motivated, who loves to play and snuggle and even, gasp, sleep on the bed! We bonded immediately – there was no doubt. The only real behavioural challenge we had right off the bat would be his fears. Fear of men, fear of dogs, fear of noises, fear of traffic, fear of anything novel. Walking with him was a challenge – he pulled in every direction, body low to the ground, ears pinned, drooling, eyes wide, trembling. A bus would approach and he would try desperately to dart away, even if it meant into traffic. The panic was real. When certain men approached, he would freeze, stare, back up, pin his ears and bark while trying to hide behind me. When he saw dogs, he would initially be excited but if they came close, he would stiffen and freeze. If they sniffed his backside, he would immediately whip around and either pin them (if they were small dogs) to the ground, or nip them on the face or neck (if they were larger). Not to mention that he would stiffen and growl if I approached him while he was in possession of a stuffed Kong. Boy…I had my hands full. All the while, he was having a rough time health-wise, too. He was desperate to pee every 1.5 – 2 hours all day. He had me up at 5:30am every morning and seemed lethargic compared to my idea of a Border Collie / Cattledog mix. He had diarrhea at least a few times a day which ended up being increasingly concerning (containing mucous and blood) and eventually he would start vomiting blood as well. We spent some quality time at the vet clinic, running blood work, stool samples, urine samples, and physical exams, but no issues presented. We were all stumped. I started to feel hopeless – what had I done? I just spent the last few years taking care of a dog who needed extensive care and here I was again, except this time the dog was not a geriatric, he was a young pup – one I had not yet bonded with. The thought of returning him crossed my mind, night after sleepless night. I started leaving my condo in the daytime and sitting at the pub down the street to get some work done and get a break. I felt awful, guilty, resentful, frustrated, tired, sad, and more than anything else, I was missing Parker. 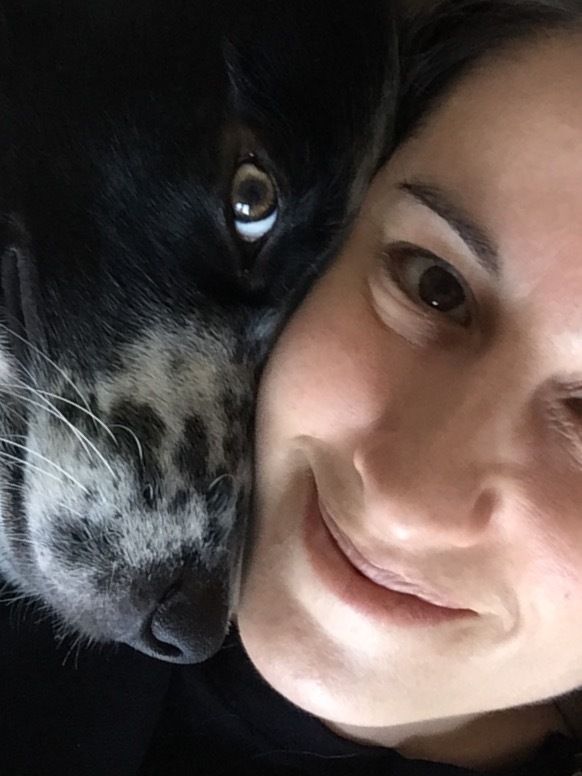 I wanted so badly to love a dog again and I felt like perhaps I made a mistake. I wondered if this is how everyone feels when they adopt a dog. Are these typical emotions? Or a sign that I wasn’t ready? Why couldn’t I as the professional figure this out? I doubted my abilities as a trainer and coach as each day passed. My confidence shaken. I felt sick. How would I explain this failure? Worse yet, how would I explain to this newly adopted dog that I made an impulsive and incorrect choice and he was to go back to the rescue and not likely to be placed in a loving home due to his issues and bite history? Needless to say, they were dark days.